Who German Army Group North initially under Field Marshal Wilhelm Ritter von Leeb (1876–1956) with token support to the north and east of Leningrad from German-allied Finnish units under Marshal Carl Gustaf Mannerheim (1867–1951). In January 1942 von Leeb was relieved of his command and replaced by Col-Gen. Georg von Kuechler (1881–1968), who that August was replaced by Field Marshal Erich von Manstein (1887–1973). Arrayed against Army Group North were the Soviet Leningrad Front under various commanders, among them Gen. Georgy Zhukov (1896–1974) and from June 1942 Marshal Leonid Govorov (1897–1955), and the Volkhov Front under Gen. Kirill Meretskov (1897–1968). 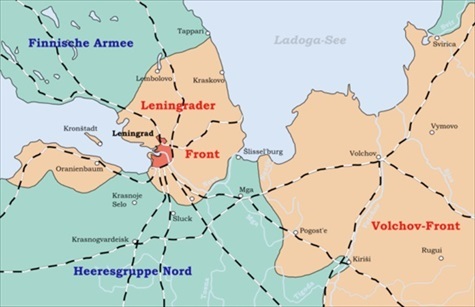 The Volkhov Front was dis­banded and incorporated into the Leningrad Front in April 1942. Total military strength with reserves and volunteers reached two million men on all sides when the siege began. Why Leningrad was an early target of Hitler’s Operation Barbarossa, lying across the path of the German advance into the north of Russia and around to the east of Moscow, the capital of the Soviet Union. If German forces could unite with the small, but tough, motivated, and skilled Finnish forces, their combined armies could quite possibly drive through Northern Russia, capture Moscow, and win the war for Germany. What At the outbreak of World War II, Leningrad was a city of three million people lying in the far north of Russia. It was the second largest city in Soviet Russia and represented 11 percent of the national economy. Situated on the Gulf of Finland, Leningrad was a nexus of road, rail, and shipping links between the Baltic Sea and the Soviet interior. On June 22, 1941, Army Group North surged across the Soviet border, ripped through the Baltic States (Lithuania, Latvia, and Estonia) and by September 1 was lobbing artillery rounds into the city. Outcome When Hitler switched Operation Barbarossa’s priorities to targets in the Ukraine and the Cauca­sus oilfields on September 6, 1941, drawing down von Leeb’s panzer strength, the assault on Lenin­grad was converted into a siege with constant long-range artillery and aerial bombard­ment, which in turn was crippled on the German side by a rotation of increasingly frustrated army commanders. Germans looted and destroyed historic land­marks outside the defen­sive perimeter, while inside the Russian lines food depots, apart­ment blocks, factories, schools, hospitals, and other civil infra­structure were laid to waste. A narrow and dangerous corridor of water or ice on the east side of the city (variously known as the “Road of Life” and the “Road of Death”) struggled to supply a starving popu­lation with food and fuel. One million used the road to escape. On city streets the dead piled up, covered by snow until spring. On one day alone, 13,500 deaths occurred. By the end of 1943 the German opera­tions around the besieged city had little strategic signifi­cance apart from main­taining the overall German frontline. The cruel siege remains one of history’s greatest examples of defiance, but at a ghastly cost: One to 1.5 million Lenin­graders died from mal­nutrition, expo­sure, disease, bombing, and shelling and over one million members of the Soviet armed forces were killed, captured, or declared missing. German casual­ties are unknown. The January 1944 collapse of the German siege of Leningrad was a key ingredient in the Wehrmacht’s defeat on the Eastern Front.